The process was clear with realistic deadlines, helpful reminders, and great hands-on training. The easy page-building tools meant even the novice on our team could move things forward without hitting roadblocks. This helped us quickly build a scalable tool to help our community grow. Using our new drag and drop website builder, Mightybytes streamlined online communications for the local B Corp community to raise awareness of people using business as a force for good in Illinois. Certified B Corps are for-profit companies certified by the nonprofit B Lab to meet rigorous standards of social and environmental performance, accountability, and transparency. Including Mightybytes, there are 35 such companies headquartered in the state of Illinois. Yet to anyone outside the community, it was difficult to find Illinois-based B Corps, join the local movement, or get up-to-date information on area events. This was hampering the community’s growth potential. To test drive the process for our new drag and drop website builder Drag+Fly, we designed a robust, scalable, and easily updatable website for the Illinois B Corps community. A Drag + Fly project in a nutshell. We created Drag+Fly as a middle ground between low-cost website builders like Wix or Squarespace, which can be simple to use but also easy to break, and our custom enterprise website solutions, which are far more robust but also require a longer timeframe and carry a higher price tag. What sets Drag+Fly apart from other drag-and-drop website builders is hands-on training and support from a dedicated and experienced agency team. The full process is scheduled to take three months from initial kickoff to product launch. This gives both agency and client the appropriate time required to style website components, input content, and make any necessary revisions prior to launch. We worked with our friends at fellow B Corp Meliora Cleaning Products to bring the Illinois B Corps site to life. We facilitated two workshops with our clients at Meliora Cleaning Products, another B Corp that volunteered time to produce the site. (PS: You should totally buy Meliora’s products, they’re awesome.) 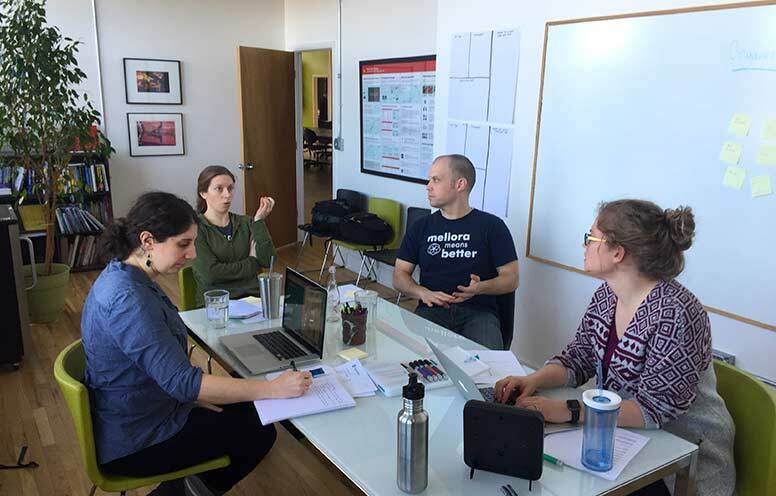 The first, a discovery and planning session, helped us level expectations, set goals, and create consensus on how to meet those goals within project constraints. For the second workshop, we trained the Meliora team how to use Drag+Fly to create pages and input content. Between workshops, the Mightybytes team created page templates and styled components to match existing B Corp brand guidelines while the Meliora team focused on creating and entering content into the site. Collaborative workshops and a detailed training manual helped projects stakeholders quickly get on board with new processes. To supplement the workshops, we provided a comprehensive training manual to help the Meliora team quickly answer questions if they got stuck. This manual features answers to common website production questions as well as descriptions of what all the Drag+Fly tools can do and how to use them. The website team could easily drag and drop up to 30 pre-styled components from a menu to create unique pages. Along the way, Mightybytes provided a block of dedicated support hours to help the Meliora team with any roadblocks. These hours could be used for anything from technical support to design production. We finished and launched the Illinois B Corps website in just under the target three-month timeline. The result is a scalable digital marketing tool that can grow as the community does and drive business goals to certify more B Corps and get more people in Illinois using business as a force for good. If you think this might be a good approach for your next website project, check out our Drag+Fly product page or drop us a note. We’d be happy to discuss options with you.